Fashionably dressed teenage couple, Margaret and Barry Kirkbride. Workington, Cumbria, England 1975. 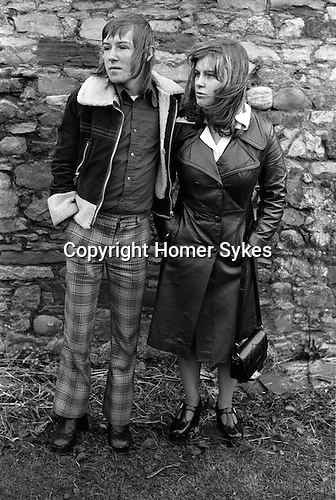 Margaret and Barry Kirkbride, he’s fashionably dressed in tartan trousers that were made popular by the boy band the, Bay City Rollers. Long hair, long leather trench coats and bomber jackets were all the rage.